This Freescale tower board is based on the KL46Z256VLL4 which is a 50MHz device from the ultra-low-power KL family with Cortex-M0+ core, USB and SLCD (segment LCD). This KL46 device has 256k Flash and 32k SRAM and is in a 100 pin LQFP, whereby the KL46 is also available in 64 LQFP, 64 BG and 121 pin BGA housings. There is an 8MHz crystal on the board for clocking the part. uTaskerSerialBoot_TWR-KL46Z48M_KBOOT_HID_UART_MSD.bin KBOOT compatible USB-HID loader with composite USB-MSD loading, as well as KBOOT UART loading on UART 1 at 57'600 Baud [16.6k] allowing applications to be loaded at link address 0x8080 (using Freescale's KBOOT USB connection, or KBOOT UART at 57'600 Baud or USB-MSD when the board appears as upload hard disk). When operating, the green LED blinks at 5Hz. To force the loader reset the board with push button SW2 held down. To disable the watchdog reset the board with push button SW4 held down. This can be loaded using the TWR-KL46Z48M's USB-MSD (OpenSDA) boot loader. Note that the loader limits application sizes to 70k - it can be built without limits using the µTasker project. Note: The push button SW2 is connected to a port that is used to drive a segment of the SLCD which means that holding the button down causes interference to the display when it is mounted. This is a HW design issue on the TWR-KL46Z48M but is not otherwise serious. 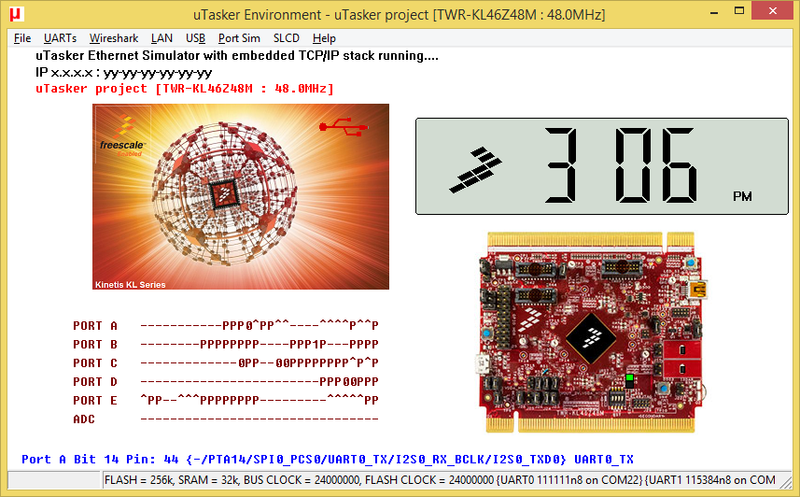 uTaskerV1.4.8_BM_TWR-KL46Z48M_8080.bin TWR-KL46Z48M application with command-line menu on the virtual COM connection (115'200 Baud) with various menu items (as well as on UART2), including the ability to switch to USB-UART-2 bridge mode with end-to-end flow control. Output from the on-board accelerometer can be viewed in the I2C menu. Low power modes can be set in the application menu. The local time can be set in the administrator menu and is displayed in the SLCD (needs TWRPI-LCD attached - see also Segment LCD user's guide). For more information concerning the RTC in the KL family see KL RTC operation, whereby it is to be noted that the TWR-KL46Z48M has a low power 32.768kHz oscillator which allows RTC_CLKIN to be used. The USB device is a composite USB-CDC with three interfaces, whereby the first is connected to the command line shell (in the USB menu it is possible to command a bridging mode to UART2). The second performs full-time USB-UART bridging to UART0 (Tx = PTA14, Rx = PTA15). The third performs full-time USB-UART bridging to UART1 (Tx = PTE0, Rx = PTE1). Drivers that can be used for this device are available below. The processor runs at 48MHz. [39.7k]. uTaskerV1.4.8_TWR-KL46Z48M.bin The same TWR-KL46Z48M application as stand-alone software that can be loaded using the TWR-KL46Z48M's USB-MSD (OpenSDA) boot loader [40.7k]. software.bin. A TWR-KL46Z48M application that can be loaded using the USB-MSD host (memory stick) loader (see below) [23.9k]. Debug output is available on UART 1 (on OpenSDA virtual COM) at 115'200 Baud [25.6k]; applications to be loaded at link address 0x8080. The application "software.bin" can be loaded (see above). When operating, the green LED blinks at 5Hz. To force the loader reset the board with push button SW2 held down. To disable the watchdog, reset the board with push button SW4 held down. This can be loaded using the TWR-KL46Z48M's USB-MSD (OpenSDA) boot loader. Note that the loader limits application sizes to 64k - it can be built without limits using the µTasker project.